Conservation easements are often done on forestland to keep the land from being developed while allowing some type of prescribed logging. But those easements usually involve a private landowner with a sense about when his land might be developed and what it might be worth on the market. Trading his future prospects for cash is a personal and financial consideration, and the purchaser of the easement can look around at other prospects. The motivations of state and federal officials in a transaction like this can be multiple, even political sometimes. Without true market conditions at play, the value of the easement could be very difficult to calculate — and probably easy to challenge. Under the Washington State Constitution, the state cannot relinquish its property without fair compensation. 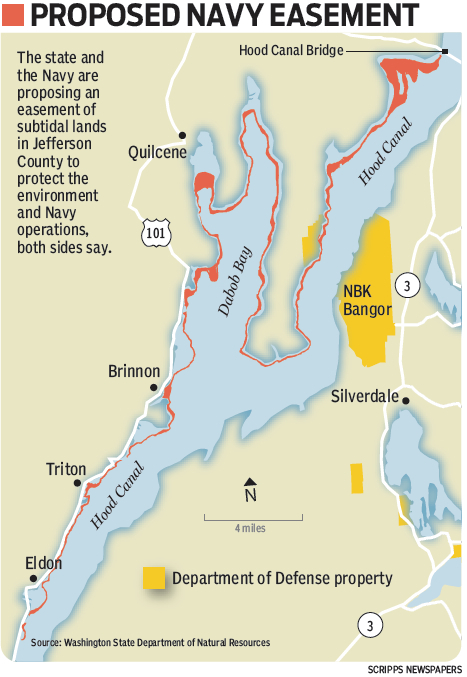 I’ll probably be accused of getting ahead of this story, but what first sounded like a great idea to preserve Hood Canal and protect the Navy’s operations may not be so easy to pull off. On the other hand, it appears that this transaction may avoid the typical environmental review required for leasing state bedlands, because there is no environmental impact without any development. The economic impacts are another issue and may require some type of analysis beyond the appraisal itself. The Navy considers the proposed easement to be part of the Readiness and Environmental Protection Integration (REPI) Program for the Dabob Range Complex. The Navy has purchased easements through a partnership with The Nature Conservancy. Recall the story by reporter Ed Friedrich, Kitsap Sun, Oct. 8, 2011. Vessel traffic, noise and security in the enclosed area of Hood Canal are all important considerations for the Navy. A REPI fact sheet (PDF 745 kb) describes the Dabob Bay Range Complex. Navy officials say they will add information about the proposed easement at an appropriate time. To learn more about the REPI program, download the 2013 Report to Congress.